When many of us think of the holidays, we are likely picture tables filled with delicious sweets, clinking champagne glasses, and other festive holiday treats. What many people don’t think of is how these holiday indulgences could stick with us through the year. However, eating additional sugary and acidic foods that are popular during the holidays can take a toll on oral and overall health. Keep reading to find out how to maintain your optimal oral health throughout the holidays and all year long. If you haven’t already visited your dentist twice this year, you still have time to schedule your second preventive dentistry appointment before the end of the 2018 dental insurance plan year! Water is essential to keep the body hydrated and healthy, but drinking water can also protect your smile. If you don’t have time to brush your teeth following the consumption of sugary or acidic foods and drinks, rinse your mouth with water. You’ll stay hydrated and limit the amount of sticky, acidic plaque that builds up on teeth. Even if you don’t brush your teeth between meals all year round, consider brushing following your potentially heavier holiday meals. You should also take the time to thoroughly brush your teeth for at least two minutes at a time twice a day and floss daily. Plaque can harden into tartar and start damaging tooth enamel within twelve hours, so do your best to brush at least that often. 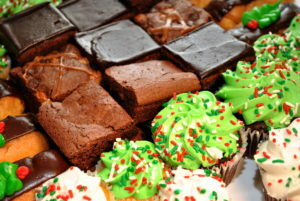 Instead of snacking on cookies and cakes throughout the day, eat your holiday sweets as part of the meal. Each time we eat, our teeth undergo an acid attack that can weaken enamel leading to dental sensitivity, tooth decay, and other oral health issues. If you’re already eating a meal, add a treat or acidic beverage. Then, brush your teeth half an hour after you eat. Many people keep a soda, glass of wine, or other acidic beverage with them throughout their holiday gatherings. Instead, finish your drink within half an hour and follow it up with a glass of water. You’ll stay hydrated, and your teeth will have less plaque buildup. If you don’t already visit the dentist for a checkup near the end of the year, talk your dentist about changing your schedule. Visiting the dentist during or right after the holidays is a great way to limit potential damage from holiday sweets. Waverly dentist, Jonathan Smiley, DMD is here to help patients keep their smiles whole and healthy all year round. With thorough preventive dentistry exams, professional teeth cleanings, and team members who truly care about helping you keep your smile healthy, the Smiley Family Dentistry team is here whenever our patients need us most. If you’re new to Waverly or a surrounding community, call Smiley Family Dentistry to find out more or schedule a dental checkup today. We welcome patients of all ages and love having the opportunity to provide comprehensive dentistry to whole families.